Porcelain kitchen sink is the most common and favored choice of many people. It is cost effective, durable and looks good in any decor. However, the clean look may not last forever. You need to clean it regularly to keep stains at bay and prevent it from losing its sparkling neat white look. Of course porcelain kitchen sinks are available in other colors too. But white is very commonly used. Antique porcelain kitchen sinks are quite in demand these days owing to their vintage/period look. Not only were they large in size, their design was also very unique. Large bowl with rimmed counter on the side (or either sides) defined porcelain kitchen sinks in olden days. Nowadays they are preferred not just for their rustic and elegant look, but also their functionality (providing large capacity for washing of pots and pans). Porcelain undermount kitchen sinks need careful installation (owing to their weight) as compared to stainless steel sinks. As such undermount sinks need very firm and strong support from beneath the countertop; and porcelain sinks need even stronger support because they are quite heavy and the weight of pots and pans along with water can really weigh down on the clamping (if it is not done properly). It is preferable to get an expert to install porcelain undermount kitchen sinks rather than doing it yourself. Porcelain kitchen farmhouse sinks are huge in size. In olden days, farmhouse sinks were meant to take heavy load of dishes, pots and pans. However, today they add a touch of class and elegance to your kitchen. Not only are they highly functional in terms of their capacities, they also come with their vintage design of a raised front side (called apron) which prevents water from spilling onto the cabinet beneath. Porcelain is often used to create similar looking farmhouse kitchen sinks. Abrasive liquids can spoil the sheen of porcelain kitchen farmhouse sinks; hence they should often be cleansed with mild soap liquid or more often with lemon. In that case they would not lose their shine and maintain the neat look. White porcelain kitchen sinks are the most commonly used porcelain kitchen sinks. Not only do they give a neat look to the kitchen, but also match with any kind of decor and color theme. However, they are prone to residual food stains and need regular maintenance. Mild cleaning liquids are good enough to maintain their shine and neat look. White porcelain kitchen sinks are also able to hide any cracks better than other sinks. So even if you have accidently dropped a heavy pan into your sink, chances of the crack being too visible are low. 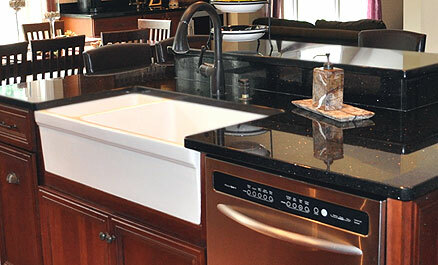 Black porcelain kitchen sinks are also preferred by many people for their elegant sheen and classy look. Black is often stylish. Though rarely found in households, but black porcelain kitchen sinks are definitely preferred for their neutral and bold color. They too gel well with any color theme. Black color hides the stains and filth very nicely and hence you can be relaxed about cleaning a black sink not as often as you clean a white porcelain kitchen sink. Whether you choose a white or black color porcelain kitchen sink, it is highly recommended that you know your requirements well. Select one that fits well into your kitchen (a large kitchen can afford an antique porcelain kitchen sink, while a small kitchen cannot). Functionality and ease of maintenance should guide your decision. Once you know what is good for your kitchen, take professional help to install, as porcelain kitchen sinks are quite heavy.